After a wonderful and lovely success of Mamaearth range of products for the newborns and toddlers, Mamaearth has come up with an exciting range of products for the Moms. Yes, they do understand and realize that the moms are backbone of a family and despite the fact that she slogs the entire day to keep her family intact and running, she also must stop for a while, rest and pamper herself, isn’t it? I’m glad to represent the brand and just not that, I’ve immensely loved the Mamaearth range for newborns and toddlers. I’ve used the products on my little Nephew Hasnain and we are thoroughly pleased with the results. My sister particularly buys all the baby care products of Mamaearth for him. The best part of Mamaearth Child Range is that the products are paraben-free, mild and perfect for a child’s skin. Now, my sister would be more than pleased to know that they have come up with Mama Range, yay!!! My previous reviews of Mamaearth products can be read here and here. This month, The Expert Aunt, as the team calls me, sent 3 products from Mamaearth range for the moms. The products came in a travel friendly pouch in shades of pink and blue. I’m always in love with their packaging. 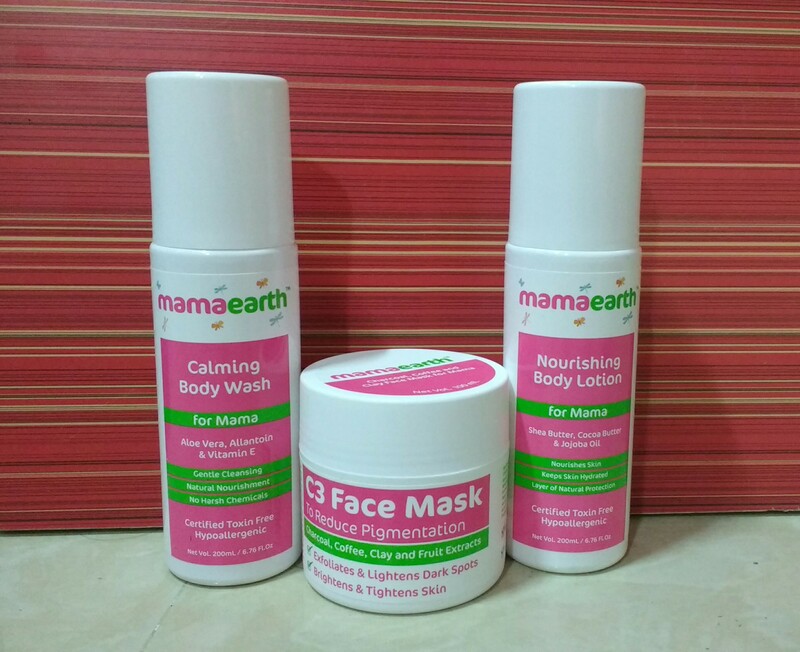 The products that I received this month are Mamaearth C3 Face Pack, Mamaearth Calming Body Wash & Nourishing Lotion. As I said, I already admire the Baby Range, I always secretly wished they had something for us, and lo, my wish is answered! I particularly love bathing and beauty products, and here, I’ve got all of them. I used them all and here is my take on the same. The Mamaearth C3 Face Pack is packed with charcoal, coffee, clay and fruit extracts, which exfoliates and lightens dark spots, and brightens and tightens skin. The Mamaearth Calming Body Wash for Mama is enriched with Aloe, Allantoin & Vitamin E, which gently cleanses our skin, nourishes naturally and has no harsh chemicals. Mamaearth Nourishing Body Lotion for Mama is brimmed with Shea Butter, Cocoa Butter & Jojoba Oil, which nourishes the skin, keeps it hydrated and gives layers of natural protection. Have you used the Mamaearth Range of products? How have you liked them? Share your insights in the comment section. Previous Previous post: India Runway Week Season 8- Season of Gold, shimmer and cuts. Next Next post: Influencer.in – A Bloggers new Best Friend.